Cancelled demo due to adverse weather conditions. I need to apologise for not being able to hold our weekly demo. We are experiencing awful weather here, deep snow and very strong winds that are dropping the temperature to between -12 and -16. I attempted to set off like usual this morning with my daughter because her school was shut due to the weather conditions, and I filmed my attempt. Walking was the only way of getting there at the time because the roads were full of snow, and it still continues to fall. Here’s my video. By the way it was live streaming via Facebook because my phone won’t allow me to video anymore for some strange reason, I never have any luck with phones. So if you don’t have Facebook then you might not be able to view it. Sorry! My intention today was to attend and hand food parcels out etc, and I did attempt to so please understand that this was not a decision that I wanted to make. I also had to assess the situation for team members, some of which were snowed in or it was too dangerous to travel. Gordon deserves a medal for digging his car out even though it wasn’t safe enough to make the journey there and back. Thank you Gordon. I also had to assess the situation regarding the temperature and wind chill. I made the decision that it was and is too cold, -13 to -16 is too cold to be standing outside for two hours. I’ll be honest, I feel a failure, that maybe I could have chanced it and that I have let people down. So please be kind. I have issued advice to claimants stating that if their Jobcentre hasn’t telephoned them to cancel their appointment then to keep a record of weather conditions, bus stoppages etc, and if they can’t attend their appointment then to telephone them otherwise they run the risk of being sanctioned. If the Jobcentre have phoned you, keep a record anyway because you never know. The same applies for any work programme appointments, workfare and course appointments. Please keep a record and inform people!! Cold weather payments have been actioned, so qualifying people will be able to receive them. If not, like me but on a low income keep warm at home, go back to bed or bring a blanket downstairs etc. Don’t go out unless you need to. Of course I understand that all areas aren’t as bad as Ashton Under lyne. SWEP is also in place so if you see anyone on the streets that are homeless please refer them to the local housing office, remember this is different in all areas. There’s also a brilliant app for mobile phones called Streetlink, download it and if you see anyone in need use the app and help will be sent. It’s free. I’ve been busy writing, planning, campaigning and attempting to hold the DWP to account. I’m not alone in this quest though and a big shoutout to my friend and fellow blogger Kate Belgrave. Shes brilliant. Life isn’t easy when you are living on a low income, and I totally understand what you are going through, I live it myself. Keep strong, know that you aren’t alone in your struggles and that I care, lots of us care. You are important. 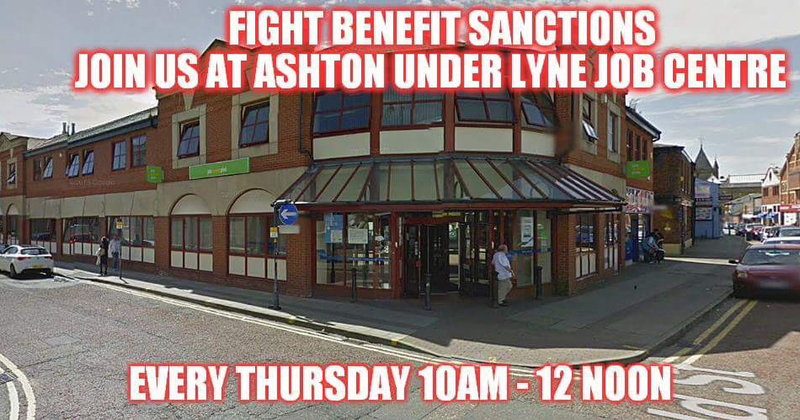 We’ve helped so many people outside the Jobcentre and will continue to do so, this is not the end its just one week. I will continue dispite opposition. Solidarity to everyone, and also to members of the team who go above and beyond to join me to help you are all amazing. What am I doing today? Trying to keep warm, and most likely a bit of writing. I hear you, the struggle is real. Solidarity. Once again my apologies and I will return, we will return next week. Please like, share, email and talk about my blog. Thank you! Please donate if you can, every penny really helps. I’m a skint single parent just trying my best to helpfolk. If you can’t then that’s also ok! DWP write to GP to advise not to give claimant sicknotes. Woman faced with eviction, man sent on a course miles away. Welcome to DWP hell. I think you made the right decision Charlotte. We’ve got a ton of snow over here too & i didnt make it in to the foodbank this morning either. When i got up it was a massive blizzard going on out there & tv news said not to venture out unless you have to. Hi Charlotte. 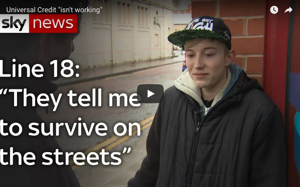 At least you tried, & that’s more than our Government is doing in these harsh conditions to assist the homeless, poor, elderly, or disabled/ill people. Hi Charlotte, you did the right thing. You don’t want to end up in hospital from exposure. Your videos play all right on my desk PC accessing your website. Didn’t need Facebook. Thanks Charlotte. Spent a few weeks in my local hospital’s cardiac unit but now on the mend. Now restarted swimming in my local indoor pool but still have difficulty walking more than a few tens of yards. Our local food banks are closed tomorrow, too. We have to take this weather seriously, and not put ourselves (and then others) in jeopardy. You did the right thing today. I still think the cold weather payment should be changed back to DAILY with the 7 continuous days BS it only has to be above zero for one day and you get nought, Milk Snatcher and her government certainly knew how to cause severe hardship plus how many towns, villages, or cities have their own weather station to tell them the temperature? Most weather observations including temperature usually originate from airports so will not be representative of the actual temp. in an actual town/city. Charlotte, please can you contact me via email? Thanks. Have emailed you – was an address on the Paypal receipt.! And I’ll pick yours up when I’ve got a space in time – probably later this evening!